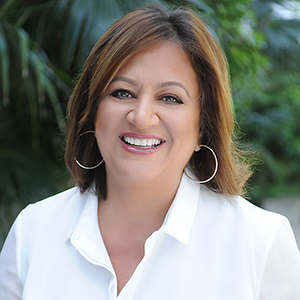 With 20+ years of experience in the South Florida Real Estate industry, Madeleine has made her mark as a top agent and broker selling residential and commercial properties. Her solid perspective of what is happening in the market along with the cutting–edge resources offered by Compass are the ultimate combination for success. She knows most neighborhoods in Miami and Miami Beach as if it were her own and has the knowledge to help make the smartest sales and investments by matching buyers to the right neighborhoods. She is constantly reading and researching to see what the next upcoming neighborhood or property investment will be. She was the 2nd highest producing agent for Compass Miami in 2016 after just 8 months at the company and in the top 10 in 2017. In 2018 she was ranked in the top 250 agents in Florida by Real Trends of Wall Street Journal. She is a member of the prestigious Master Broker’s Forum, an Accredited Buyer’s agent, Luxury Home Marketing Specialist, Certified Residential Specialist, a 5-Star certified REO specialist, and a member of BNI. Madeleine offers clients well-researched and intuitive advice on selling and buying properties. “Making sure my clients get the best property for their dollar is very important to me.” She currently serves the community as Vice Chair of the Miami Beach Chamber of Commerce, immediate past Chair of the Pillar Trustee Board and Chair of the Education Foundation, past Chair of the Real Estate Council of Miami Beach Chamber of Commerce. She serves on the Transportation & Parking Committee of City of Miami Beach and was past Chair of the City’s Service Partnership for Families and Children. This building is so unique that billionaires are buying in at an incredible rate. These exclusive oceanfront condos feature some inimitable features never before seen in high-rise luxury condominiums. This is not your run-of-the-mill luxury condo; it is truly the first of its kind in the world, with exclusive features and amenities reserved for the world's elite. This is your opportunity to experience German Design at its best - in the most avant-garde condo - Porsche Design Tower! Direct ocean views from every room in this intelligently designed 4 bed / 4.5 bath plus flex room-den. Private elevator access and wide balcony with private plunge pool and summer kitchen AND your own 2 car garage accessible directly from your residence. Enjoy sleek Porsche Design in the private restaurant with your own wine locker, chic pool areas, incredible spa and game room where you can race cars! I strongly believe in this project and long-term value and any buyer fortunate enough to purchase one of these units will not only become a member of the select few privileged enough to call this property home, but they will be making a solid investment for the future as we know Miami-Dade County is now out of oceanfront land! Call or text me today at 305.282.2133 to schedule your private tour of this one-of-a-kind offering! Retail/ office opportunity in the heart of Mystic Pointe in Aventura, FL. Unit A is leased by a mini-mart long term. Unit B is waiting for you to create your business or lease it to a prospective one. This is the lowest price commercial property in Aventura. Surrounded by 2000 residents, your captive audience will be your success. Minutes away from Aventura Mall, Fort Lauderdale/Miami airports and restaurants/retail your discerning clients will want.